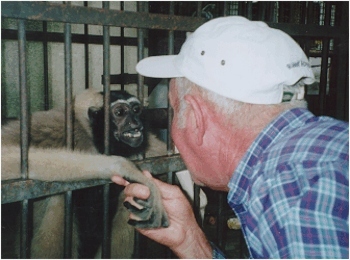 The Gibbon Sanctuary is a lifetime refuge center for abandoned, mistreated, and/or physically injured gibbons. 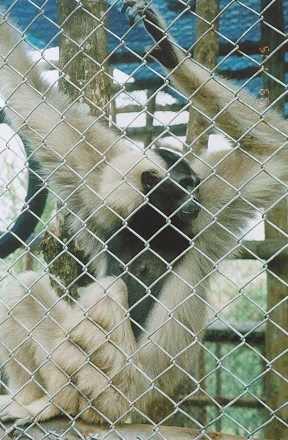 These gibbons come to Highland Farm by different paths, yet their need for special care and love is the same. Their health quickly improves knowing that they are safe and secure. None have lived in the forests and all are totally dependent on human intervention for survival. Click on Sandy's to hear sounds of Gibbons. Bill spending time with blind Adam. Highland Farm & Wildlife Refuge has carefully constructed and maintained living spaces for the gibbons, ensuring their safety and continuing needs. 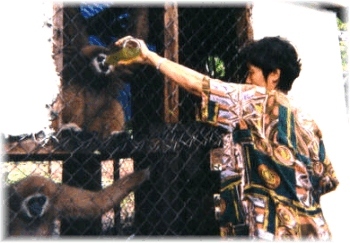 Emphasis is on the quality of daily care and attending to each gibbon's individual personality requirements. The produce from Highland Farm is used to sustain the primates. In addition, material contributions and funds from our adopt-a-gibbon project help supplement what additionally is needed for the gibbons good health such as medicines, nutritional supplements, and building materials for expanding and improving their living space. 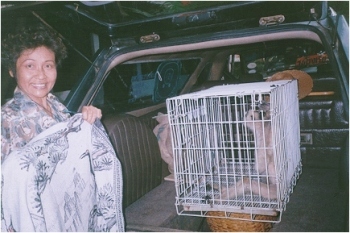 Pharanee transporting Carrie to her new home at the farm. May 1999 "Holger was born January 6th in Bangkok from captive parents. It seems he was a bit premature and could not hold on to his mother, so she rejected him. We have given him the care necessary for a newborn. 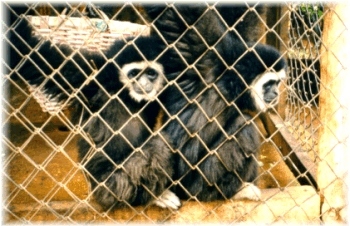 He now socializes with other young gibbons." October 1998 "...Denise is doing well. Her hair is returning and she is gaining flesh. Her hair color is silver gray...Several more months and she should recover from her starvation." 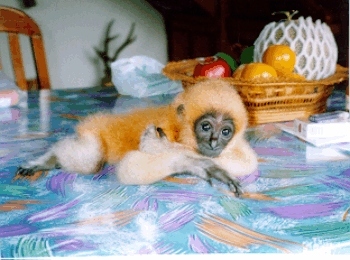 "...Just added two little children, Maggie (girl) with her right arm chewed off by an adult gibbon. She's six or eight months old, black, a real doll. 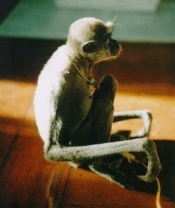 Then there is George, three years old, stunted with an atrophied right leg and arm caused by people keeping him in a bird cage for two years-poor little guy..."
February 1998 "...We went to Bangkok and adopted a little girl 'Mimi' who is crippled, missing left leg, arm and eye (caught in an electrical wire). Also, picked up Jerry with a deformed back due to a soldier's kick. Both are doing well..."
shockwave clip of her progression over a 8 month period. 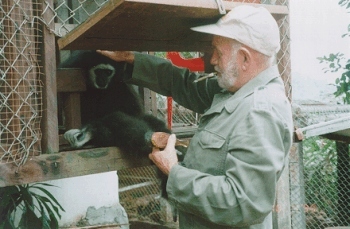 Bill making friends with a Dusit Zoo gibbon. 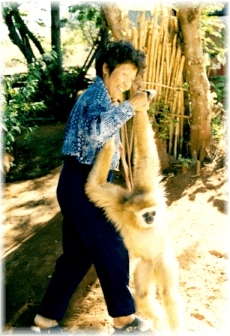 Pharanee with Charlie October 1997 "...We had great sadness this past week when our dear gibbon Lucy died. She had been fading for several weeks and nothing helped. She could only take liquid food, mostly carrots. Finally we took her to the public hospital in Prop Pra to see my doctor. He admitted her as a patient (Lucy Deters) and put her on I.V. and antibiotics. She improved a bit. We had our maid stay with her and sleep by her bed. For three days she fought to live, then on Friday Pharanee returned for her twice daily visit. Lucy grasped her hands, shuddered, and died. The hospital staff did their very best. Dr. believes she had a tumor in her intestines - I'm inclined to agree. For one year she fought to live - she was quite ill when she came to us...I built a fine teak casket for her and we buried her here at our family cemetery in a nice sunrise ceremony. She rests now with Kiki, Seriyam, Alice, and Doris..."